While no one needs to reach an “ideal” mental state in order to write or write well, it always comes as a pleasant surprise to find that I have slipped into one. Ideal states of mind are one of the greatest pleasures of writing. But what IS an “ideal” state? Is it a degree of creativity? Quality? Output? I don’t think creativity is a state of mind (I will explain this in the next blog). And I believe both productivity and quality are determined by time spent writing (both long-term and short-term). For me, an “ideal writing state” relates to how I feel while writing. 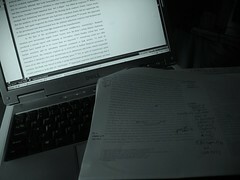 At some point while writing I realize that I am both tired and energized. My mind is both empty and full. Three hours have passed and the time span feels both very long and very short. For me, this feels like an ideal state in which to write. I say “an” ideal because I don’t have a single ideal state of mind for writing. I wasn’t always like this. At first, I thought I needed to be in a certain creative state before I started to write. Later, I thought I needed to write myself into that state. Recently, I have realized I have grown to have more ideal writing states than just that one. I think this is normal — that eveyone’s “ideal” will broaden with time. That the basic definition of their ideal will change. Probably mine will broaden and change again. What do you think? What are your thoughts on an “ideal writing state”? How does it feel when you are “in the zone”? Posted in Dragonplume, The Writer, Writing Life.Tagged craft, dragon plume, dragonplume, in the zone, writer block, writer life, writer's block, writing state. How do you think you reach that ideal state? For me, any day I can meet my 2k writing goal is a good one, but so often I find myself wanting to beat my head against my desk, with a few hundred words to go. Listening to music that my hero might enjoy sometimes gets me in the zone, but… I’m curious what other people do to get there. Hi Kirsten! Music definitely helps me slip into the zone, too. In addition to that I’ve noticed it helps when I am physically comfortable (fewer outer distractions) and mentally comfortable (I do a stream-of-consciousness journal first to rid myself of insistent, repetitive, and stray thoughts). I am more likely to reach the state after I have been writing at least an hour. Some light exercise before starting to write also helps me feel more energized, positive, and relaxed. But sometimes I just can’t reach those last few hundred words either. That’s why I’m spending the next twelve (or so) days writing about ways to be more creative. Hopefully it won’t be just me but also readers giving their ideas.